Anna Kendrick and Sam Rockwell have often been the lone bright spot in otherwise dismal movies, and it takes their combined charm to redeem Mr. 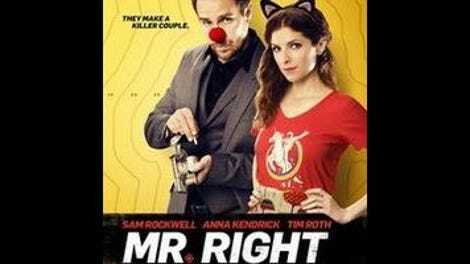 Right, an at-times-excruciatingly quirky mashup of romantic comedy and hit-man thriller. Written by the prolific Max Landis—who in the last four years has been at least partially responsible for Chronicle, American Ultra, Victor Frankenstein, and Me Him Her—and directed by young Spanish genre filmmaker Paco Cabezas, Mr. Right has more attitude than ideas. It’s a movie where the heroine gets upset when she sees her new boyfriend execute a man, and he tries to calm her down by saying, “Baby, how I feel about that guy has nothing to do with how I feel about you.” Landis and Cabezas try to balance bloody gunplay and screwball banter in ways that recall the likes of Something Wild, Grosse Pointe Blank, and True Romance, but without any of those films’ inspired genius. Rockwell plays Francis, a supernaturally agile assassin for hire who’s recently developed a conscience, and is now tracking down and killing his clientele—sometimes while wearing a red clown nose, for no particular reason. While eluding an angry assortment of former associates—led by a man named “Hopper,” played by Tim Roth—he winds up in New Orleans, where he has a chance meeting with Martha (Kendrick), a flibbertigibbet who’s just getting out of a bad relationship. She’s kooky, she’s scatterbrained, she’s wearing cat ears (because she’s helping out in her friend’s pet-adoption agency), and when she demonstrates lightning-quick reflexes at a convenience store, he senses a kindred spirit. He asks her out on the spot. Ignoring her understandable fear of being “serial killed,” she says yes. Mr. Right plays in part as a whirlwind romance—like Before Sunrise, but with gunplay. As Francis and Martha spend a few days getting to know each other, the movie functions like a satire of the breezy conversations new couples have when they’re nervously trying to impress each other. The difference is that when Martha says that she’s a luckless ditz, she’s not exaggerating, and when Francis jokes that he just had to step out into the alley for a minute to kill a guy, he’s not kidding. But Landis and Cabezas never figure out how to pitch the ironic pulpiness of Mr. Right as anything other than a glib, pointless joke. The difference between this movie and the ones it’s imitating—besides that it’s arriving about 20 years past this style’s heyday—is that Quentin Tarantino, Jonathan Demme, and similar writers and directors know when to pivot from darkly comic to genuinely cutting. Mr. Right never makes that turn. Kendrick’s Martha remains a big goofball throughout, whether she’s wondering if she can fry whipped cream or she’s babbling about her love of paleontology. And Rockwell’s Francis is numbingly unflappable: the kind of guy who stops in the middle of a one-man raid on a criminal stronghold to pick through a fellow hit-man’s bag of gummy bears, looking for the green ones. Still, for those willing to accept Mr. Right as just a derivative blood-soaked goof, only ever meant to be momentarily diverting, it’s really not that awful. The scattershot weirdness even connects for a minute or two, here and there. Roth is fleetingly funny as a mob boss pretending to be a native Louisianan—complete with ridiculously exaggerated accent—and RZA has a couple of amusing scenes as an assassin who gradually comes around to Francis’ point of view toward his employers. And while the budding relationship between Francis and Martha is no more believable than the characters themselves are, it is easy to buy Kendrick and Rockwell together. The best way to watch Mr. Right is to forget about the plot as written, and just imagine it as a movie about two delightful actors, doing their best to entertain each other while stuck in yet another forgettable indie comedy.